Potsafe - 10 essential kitchen safety rules to set, that keep little cooks safe in the kitchen. 1. Wash hands first. Yes, every time. Kitchen safety is often discussed in terms of cuts and burns, but foodborne illness is definitely an important concern worth addressing. 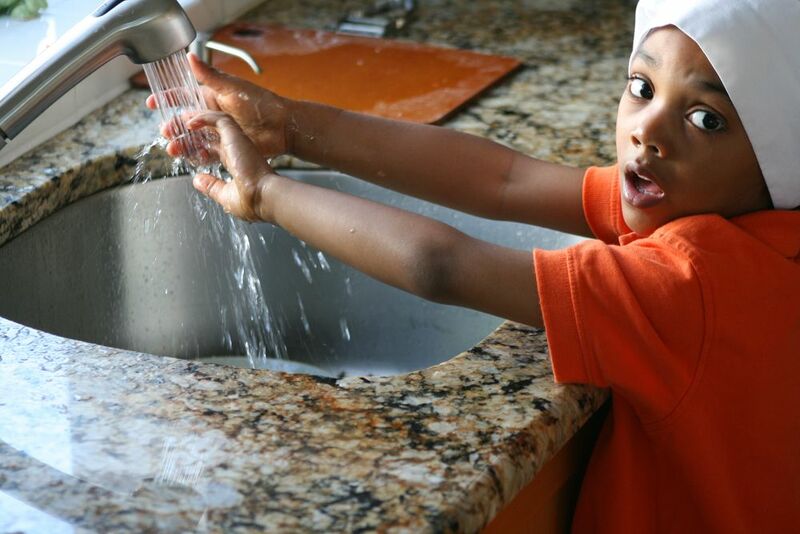 The number one best way to make sure that kid chefs and their eaters stay safe is to insist that everyone wash hands before cooking and throughout the cooking process. This goes double if you’re working with raw meat or eggs. 2. Tidy yourself, and your space. Cleanliness actually creates safer cooking conditions, and kids should understand that it applies to both yourself as well as to the kitchen. So before cooking, make sure that everyone in the kitchen securely rolls up loose sleeves (or removes loose clothing altogether) and ties back long hair. You want to avoid anything catching fire, of course, but you also want to avoid catching a sweatshirt sleeve, a loose friendship bracelet, or a long necklace on anything that could tip a hot pot or tug on a sharp knife. And speaking of loose materials, also be sure that paper towels, kitchen towels, pot holders and other flammable items are kept away from stovetop burners. 3. Rise above it all. It’s critical to ensure balance and control when working with — or even just around — knives or hot pots and pans. It’s also important to have a clear view of everything that’s going on around you while you cook. But when you’re a kid, that’s not always so easy, especially when the counter is taller than you are! A smart kitchen safety rule is to always have a sturdy, stable, comfortable stool or stepladder of some sort available. Insist that kids hoist themselves up onto this stool so they stand securely above the counter before they embark on any cooking task. This rule may be obvious, but some kids are inclined to take shortcuts or get distracted in the kitchen, which can lead to unnecessary burns. Use potholders: Let them know about the essential need for potholders and oven mitts, and be sure to provide them with ones that fit them properly and grip surfaces well. They should never wad up a kitchen dishtowel to remove a brownie pan from the oven or (yikes) touch a pot handle with bare fingers to see if it’s hot. Hold onto those handles: If your child is old enough to help with food that’s cooking, also spend some time to make sure they are able to tightly grasp any pot or pan handle while adding to, tossing, or stirring food inside. Part of this is eliminating distractions; if they’re singing along to music, or watching a video on a tablet while carrying a hot pot between the stovetop and sink, then 100% of their attention is not going toward gripping that handle safely. 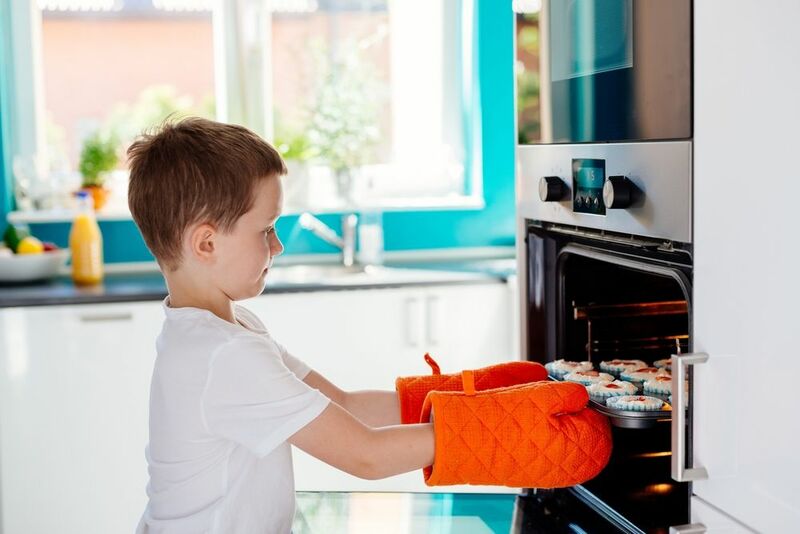 Talk about what’s hot and what’s not: I also find that kids respond best to kitchen safety rules — or all rules, really — when they understand why you have them in the first place. So it’s a good idea to talk about why pot handles get hot. Have an educational discussion about conductivity, and how anything metal like a colander, the beater on a hand-mixer, or a spoon left too close to a stovetop can be scorching hot, even if it wasn’t in the oven. The same goes for dishware or glass, like a Pyrex baking pan. If kids do get a burn, Web MD has tips we like. For a minor burn, run cool water (not ice water) over the burn, or cover with a clean towel wet with cold water; then cover with a bandage. No butter! I always tell my kids “no hokey pokey with the pots.” In other words, when it comes to pots and pans on a hot stove, be sure not to turn one handle in and the other one out. Rotate all handles toward the back of the stove. If a handle is poking out into the room, it’s way too easy for them to be accidentally knocked over or grabbed by a younger child. Obviously we want neither of those things to happen, so fortunately, this is one kitchen hazard that’s really easily avoided. 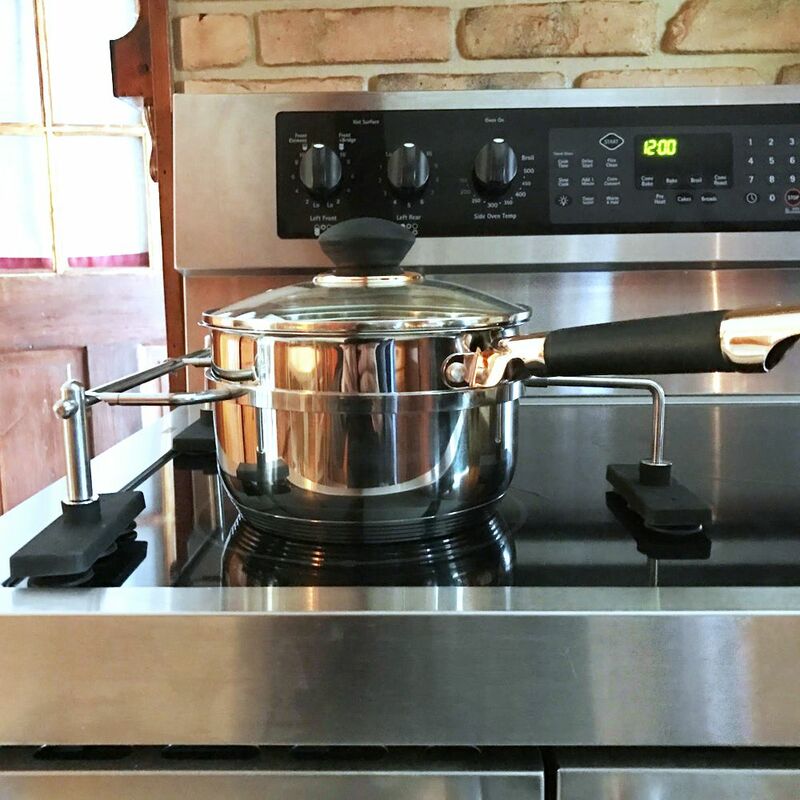 Potsafe is an easily assembled kitchen accessory that cleverly locks the included signature pot into place on any ceramic or glass induction stovetop, or smooth surface cooktop. Strong suction cups secure a metal ring to the cooktop surface, and then the pot fits into the ring, which essentially locks it in place. The pot can still be lifted, lowered, or turned easily, but cannot be pulled off the stove, ensuring that little hands can’t yank scalding food onto the floor (or themselves), helping to keep everyone more safe in the kitchen. Order yours before the end of November to get 10% off and free shipping to mainland USA using the code COOLMOMMA. 6. Oil and water don’t mix. This is one of those kitchen safety rules that may be so ingrained in us, we forget to talk to our kids about it. They need to know that when oil is hot, water can cause the oil to splatter or splash back, potentially causing burns. In other words, they shouldn’t copy those chefs on TV who splash a drop of water on an oil-coated pan to see if it’s hot enough. 7. Follow the fire safety plan. It’s so so so important to talk fire safety of all kinds, but especially in the kitchen. First and foremost, be sure there is a fire extinguisher nearby at all times and that kids know how to use it. If there is a fire though, what’s most critical is that children get an adult’s attention right away, and get out of the area themselves. If a fire does erupt and it’s small, use baking soda or flour to put it out. But everyone — especially kids — should know that water is not the way to squelch a fire. In fact, it can make a fire bigger. And be sure kids know your family’s evacuation plan, in the case that a fire does get out of control. While you’re at it, be sure to remind kids about calling 911. You should program the local fire department number into your home phone speed dial or your mobile favorites list, just in case. Better safe than…not safe. 8. Use good knife skills—or skip the knives. Keep them sharp: Seasoned home cooks know that sharp knives are safer knives. While it may sound counterintuitive, dull knives require the cook to push down harder, increasing the likelihood of dangerous slips. So while you want your little chef to be using a sharp knife, that means they need to have basic knife skills. 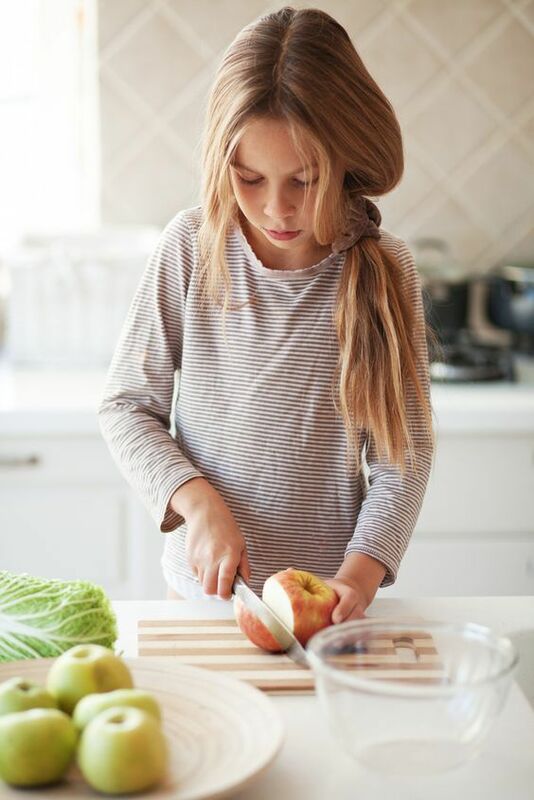 Know how to use them: Our guide to teaching kids cooking skills by age recommends chopping as a reasonable task for children 5 years and older (provided they have ample fine motor dexterity) and we have really terrific tips to get you started. If children are using a knife to help chop, pick a designated spot away from the edge of the counter for them to place the knife when it’s not in use — and to put it down in a way that makes the handle (not the blade) easy to grab when they’re ready to chop again. Consider knife alternatives: If you don’t think that your child is ready to use a knife or you just don’t want them to, consider using kitchen chopping tools that we recommend as alternatives, even for adults. All are great for kids — though skip the mandoline if your child cannot securely hold onto the finger guard. Every knife in its place: Also, knife safety isn’t over when chopping is over! Be sure you have a designated safe place for everyone to place knives when prep work is done. And no, that doesn’t mean a sink full of water; we don’t want anyone on dishwashing duty risking cuts while reaching into a cluttered sink. 9. Close up shop safely. Cooking often starts as a calm, fun activity, but can leave even the most seasoned home cooks frazzled and forgetting a few basics at the end. Kids need to remember to “close up shop” properly. That means double-checking that all knives are put away, hot pots and pans are out of reach, slippery spills on the floor are wiped up, and above all, the stovetop and oven are turned off. If it’s helpful, create an END OF COOKING CHECKLIST and keep it on your fridge door or somewhere on the counter. Away from open flames, of course. 10. If there’s any problem at all, tell a grownup. While we want to encourage independence in our kids, it’s just as important to let them know that you’re there for them any time, especially when it comes to kitchen and cooking safety.